AUGUST 2018 I DESIGN007 MAGAZINE 31 ity to access and modify those packages. Given that access, not only can the PCB designer evaluate the impact of component placement on the routability and layer count, but they have the ability to suggest modifications to the larger components to optimize their breakout and power access and minimize layer count. 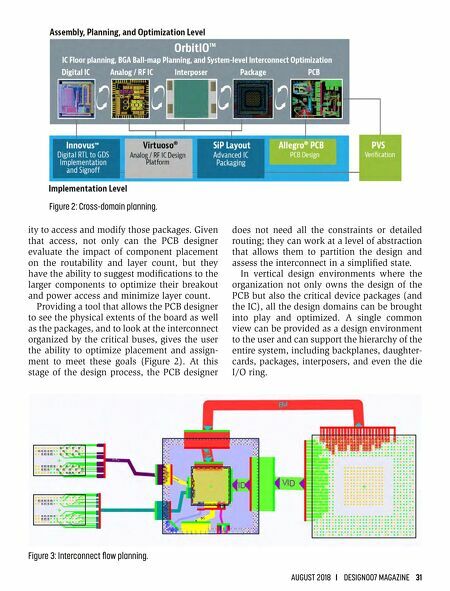 Providing a tool that allows the PCB designer to see the physical extents of the board as well as the packages, and to look at the interconnect organized by the critical buses, gives the user the ability to optimize placement and assign- ment to meet these goals (Figure 2). At this stage of the design process, the PCB designer does not need all the constraints or detailed routing; they can work at a level of abstraction that allows them to partition the design and assess the interconnect in a simplified state. 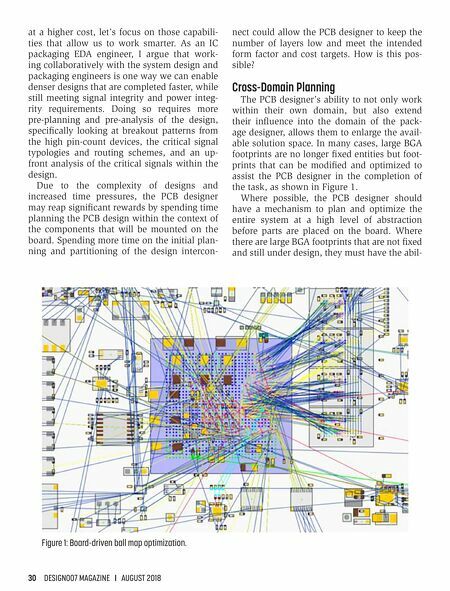 In vertical design environments where the organization not only owns the design of the PCB but also the critical device packages (and the IC), all the design domains can be brought into play and optimized. A single common view can be provided as a design environment to the user and can support the hierarchy of the entire system, including backplanes, daughter- cards, packages, interposers, and even the die I/O ring. Figure 2: Cross-domain planning. Figure 3: Interconnect flow planning.